← "Show Us Your Stash"
Judy from Patchwork Times has us posting our work environments again today, asking what we’ve got on our design wall. I do love looking at some of those fabulous prints in their unfettered, unadulterated state… before I mangle them into useless heaps of scraps that I might as well light on fire. Someday, once I figure this stuff out, these may turn into wonderful little nuggets of bags or projects (a bunch are home decor weight.) You can see I’m slowly overcoming my Fear of Pink – while I’m not entirely comfortable with it, I’m beginning to appreciate some of its nuances. The brown floral print on pink is a current favorite, though I’ve no idea what to do with it, apart from perhaps lining a bag. As of later this week, though, the design wall is going to get used. I’m working on a 9-patch (or perhaps a disappearing 9-patch) pattern using fabrics I’m just not that wild about. 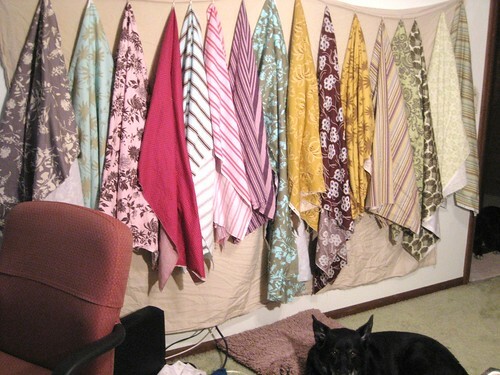 Not liking the fabrics has given me permission to cut into them and attempt to actually Make A Quilt. I spent untold hours pressing, clipping threads and cutting this weekend, followed by a few hours of piecing the three-strip pieces together, then cutting them apart. 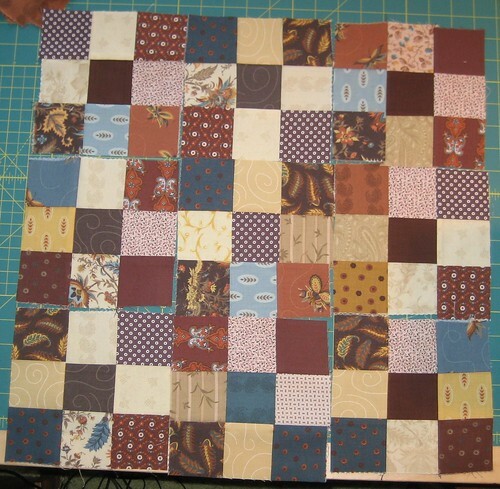 I even managed a few “cliche country pattern” blocks, a few of which are (holy crap) the same size. I’m still having the damndest time maintaining that 1/4″ seam allowance, but I’m slowly getting better. The main thing I wrassle with is, once the fabric starts drifting one way or the other… getting it back on track seems nigh-impossible without stopping the machine and actually physically rearranging the stuff. I’m fairly certain I’m Doing It Wrong. 1 response to What's on your design wall?